remember that time we went to melb? 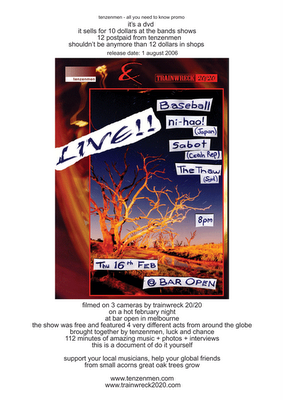 and played that rad gig with sabot and ni-hao and baseball?? no? well luckily for you it's been immortalised in a dvd which is available for purchase from us for a measly $10. so umm, how can i get a copy...? can't wait for you guys to be in syd again! and we're coming back to melbs so we should all hang out. hey! hahaha i didnt bother to actually *click* on the pic till after I posted that comment.... then i realised that its all clearly explained.. lol..
you guys rock.. steph, u are an amazing guitarist.. u have inspired me to get a boss dd-20, however funds do not permit as yet lol..